Acetylcysteine: 200 mg / sachet. Excipients : Sodium bicarbonate, Citric acid anhydrous, Aspartame. Lemon flavor. The viscosity of pulmonary mucous.secretioos.depeods on the concentrations of mucoprotein and to a lesser extent deoxyribonucleic acid (DNA). The latter increases with increasing purulence owing to the presence of cellular debris. N-acetylcysteine exerts a mucolytic action on mucous secretions. This effect is probably related to the sulfhydryl group which opens disulfide linkages in mucous thereby lowering viscosity. The mucolytic activity of N-acetylcysteine is unaltered by the presence of DNA and increases with increasing pH. Significant mucolysis occurs between pH 7 and 9 N-acetylcysteine can be used as an adjuvant in conditions characterized by dense and viscous mucous secretions. By liquefying these secretions, N-acetylcysteine assists in their evacuation and diminishes the risk of those complications ascribed to mucous retention. 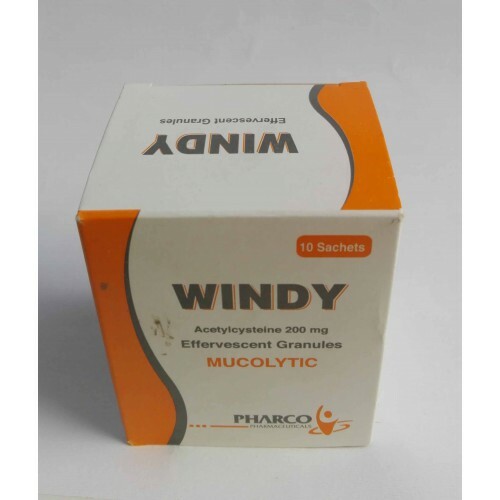 – Windy is indicated as adjuvant therapy for patients with abnormal, viscid, or inspissated mucous secretions in such conditions as: chronic bronchopulmonary disease (chronic emphysema , emphysema with bronchitis, chronic asthmatic bronchitis, tuberculosis, bronchiectasis and primary amyloidosis of the lung). – Pulmonary complications associated with surgery. – Atelectasis due to mucous obstruction. – Diagnostic bronchial studies ( bronchograms, bronchospirometry, and bronchial wedge catheterization). – Windy is contraindicated in patients with known previous hypersensitivity to N-acetylcysteine. – Contraindicated for children under 2 years old. After proper administration of Windy (acetylcysteine), an increased volume of liquified bronchial secretions may occur. When cough is inadequate, the airway must be maintained open by mechanical suction if necessary. When there is a mechanical block due to foreign body or local accumulation, the airway should be cleared by endotracheal aspiration, with or without bronchoscopy. Asthmatics under treatment with Windy should be watched carefully. Most patients with bronchospasm are quickly relieved by the use of a bronchodilator given by nebulization. If bronchospasm progresses, the medication should be discontinued immediately. Windy contains aspartame (an artificial sweetener) and should therefore be used with caution in patients with phenylketonuria (metabolic disorder). 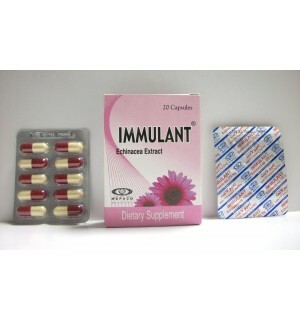 – This drug should be used with care in case of gastric or duodenal ulcer. – Occasionally, severe and persistent vomiting occurs as a symptom of acute acetaminophen overdose. Treatment with oral acetylcysteine may aggravate the vomiting in addition, when Windy is used as an antidote for acetaminophen overdose, patients at risk of gastric hemorrhage (e.g., esophageal varices, peptic ulcers, etc.) should be evaluated concerning the risk of upper gastrointestinal hemorrhage versus the risk of developing hepatic toxicity, and treatment with acetylcysteine given accordingly. – Mixing acetylcysteine powder with a proper amount of liquid minimizes the propensity of oral acetylcysteine to aggravate vomiting. reproduction studies have been performed in rats and rabbits at doses up to 17 times the human dose and had revealed no evidence of impaired fertility or harm to the fetus due to acetylcysteine. There are however, no adequate and well-controlled studies in pregnant women. Because animal reproduction studies may not always be predictive of human responses, this drug should be used during pregnancy only if clearly needed. exercised when Windy is administered to a nursing woman. This drug should preferably be taken before meals. Children 2-7 years of age – 200 mg twice daily. Adults – 200 mg three times daily. 6 years and above – 200 mg three times daily. Dosage can be increased by the physician upon evaluation of the effects of treatment. Acetylcysteine powder should be dissolved in % glass of water and taken by mouth. Avoid adding other medications to the Windy solution. laminated foil sachets and an inner leaflet. – Store at temperature not exceeding 30° C, in a dry place.